The power of the mind to affect the body may be nowhere better illustrated than in the practice of Tummo, a Tibetan advanced meditation technique in which great heat is produced through specific postures, breathing methods, and visualizations (imagination). Stories have circulated about the ability of Tibetan monks to dry wet sheets on their bare skin in the below freezing temperatures of the mountains of Tibet and Nepal. In this article from the archives of the Harvard University Gazette from April 18, 2002, Gazette staff writer William J. Cromie writes about the experiments run by the renowned Harvard professor and mind/body researcher Herbert Benson (best known for his work on The Relaxation Response ). 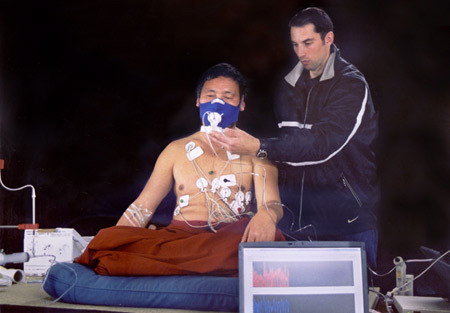 Here, modern medical measuring tools are used as Tibetan monks are practicing the meditation. I have had just a bit of instruction in the use of Tummo and can testify with first-hand experience as to its ability to raise heat significantly in the body. Through the study of this kind meditation, western science is beginning to understand how effective the use of the mind can be to effect the body. Through the combination of scientific study and centuries-old meditation techniques, the potential is there to find better treatments for some illnesses and, maybe, better life-styles to prevent the need for those treatments. Find out more about Tummo here, and here . What do you think about this?